Triple bonded steel connectors for extreme torsion and tensile strength. High sheen fibreglass composite rods minimise snagging and splintering. 5mm rods offer the optimal balance of rigidity and flexibility for the majority of cable routing requirements. Slimline connectors reduce snagging. 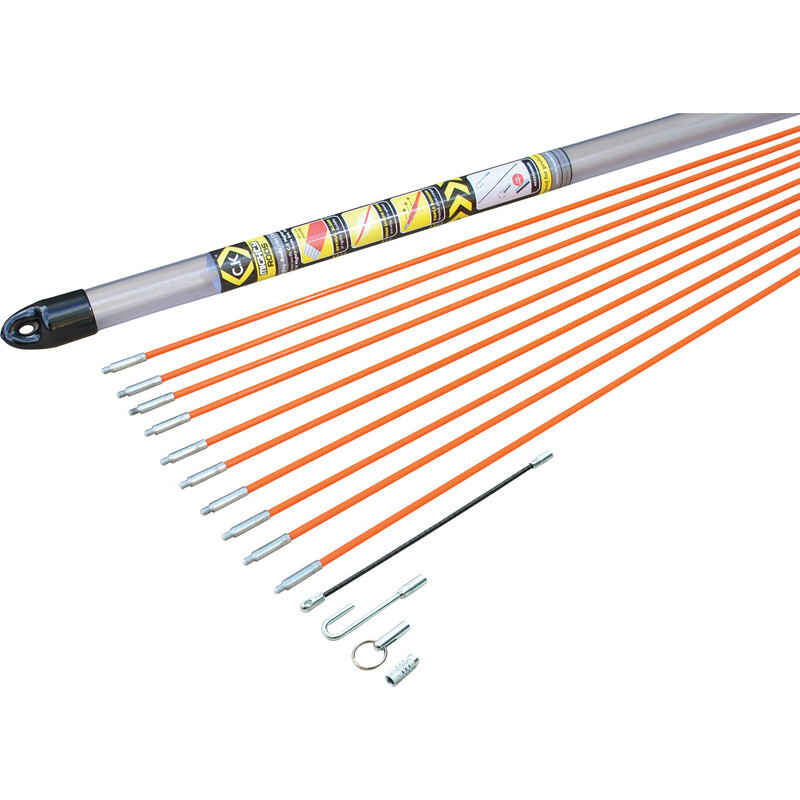 Comes with: 10 x 1m rods, cable hook, mini eye & ring, coiled steel 190mm flexi-lead, 5mm adaptor (enables use with other brands). C.K Mighty Rods Cable Rod Set 10m is rated 4.9 out of 5 by 10. Rated 5 out of 5 by Cheekychippie from Quality item Certainly not the cheapest but you really can feel the quality in this product. One slight criticism is that the rods seem to unscrew easily so care needs to be taken to ensure they are right when assembling. Rated 5 out of 5 by Vik 1 from Excellent kit Very useful - strong and gets into the areas that you want with ease. Rated 4 out of 5 by Higgy Pop from Good value Bought 2 packs of these in addition to an older set we had to take draw cord through ducting. Worked very well. These rods have a thicker diameter thread compared to the older set which have a tendency to break off. Rated 5 out of 5 by andy321 from Do the job well! Good value for money. Used a lot in my job and couldn't do without them. Old rods are now damaged hence the purchase of these new rods. They seem fine.